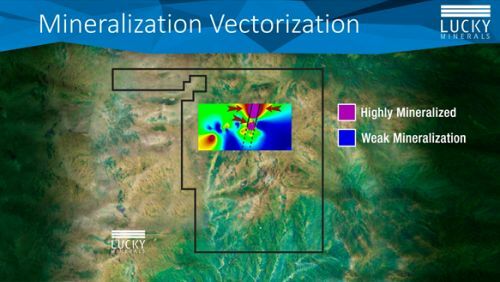 Vancouver, BC, 16 October 2018 -- (ACN Newswire) -- Lucky Minerals Inc. (TSX.V: LKY) (OTCPK: LKMNF) (FRA: 8LM) ("Lucky" or the "Company") is pleased to announce the results of a geological reconnaissance mapping survey conducted on its Fortuna Project located approximately 60 km south-east of Town of Cuenca, Ecuador. Prospecting and mapping were undertaken based on prior structural and enhanced alteration mapping studies using satellite imagery which were conducted in May/June 2018. Results from these studies led to the identification of 4 high prospectivity areas (A to D) covering 8 km2 in the Fortuna 3 concession. Subsequent prospecting and mapping of Area A (2 km2) (Image 1) resulted in the discovery of two porphyry systems with approximate dimensions of 1.2 km on strike by 300m wide. A pluri-kilometric oxidation blanket composed of silica, limonite, jarosite and hematite surrounds the two porphyry systems. Preliminary assessment of these two porphyry systems using major elements calculations is confirming field observations with an extensive potassic signature enrichment including an outer shell of pyrite mineralization typical of phyllic alteration that has been traced for more than 300m. Lucky's exploration team believes that these two porphyry systems may in fact form one single doughnut shaped body measuring approximately 2km in diameter. Saw sampling over the area outlined quartz monzonite rocks with pyrite and oxidized pyrite being the dominant sulphide mineral along with minor Chalcopyrite, Chalcosine, Molybdenite and Malachite (Oxide). 176 samples were sent to MS Analytical lab- oratory including 15 control samples for major oxides and ICP multi-element as- says; multi-elements results are pending. 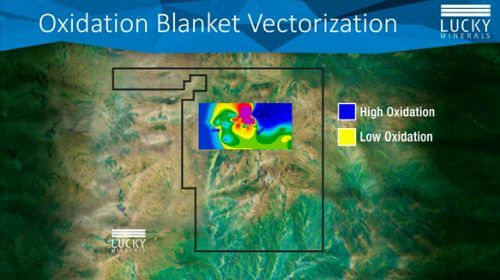 Lucky's immediate next steps to advance exploration on the property will be an airborne magnetics combined with radiometry survey with 3D inversion, improving the existing dirt road and trails to an all-weather 14 km gravel road, to be followed by an aggressive grid-style comprehensive sampling program along the two identified porphyry systems on Fortuna 3 as well as regional prospecting on the 40 km major regional NNE structure and other major regional NNE trending structures observed on the property. This may be followed by a drilling program in 2019. Fortuna 3 is one of 12 contiguous concessions which make up the Fortuna Property which has seen virtually no exploration and where considerable potential exists for finding significant porphyry and epithermal Cu-Au mineralization. It should be noted that no field work has been undertaken yet by Lucky and limited historical work was performed on the remaining 11 Fortuna concessions. Rock samples on the project were assayed by standard 30 grams fire-assaying with AA finish for gold, four acid ICP-OES for multi-elements (including Cu and Mo) and XRF for major elements (oxides) at MS Analytical in Vancouver, BC. Ex- ploration program design and interpretation of results is performed by a qualified person (QP) employing a Quality Assurance/Quality Control program consistent with industry best practices, including the use of standards at every 10 samples. 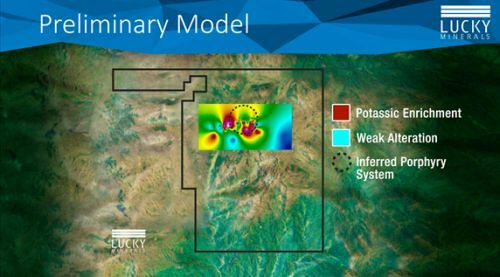 Lucky is very pleased by the results of this summer 2018 reconnaissance exploration program and will continue to characterize in more details the two identified porphyry systems and aggressively exploring and prospecting other targets on Fortuna 3 as well as on the 11 remaining concessions of its Fortuna Project. 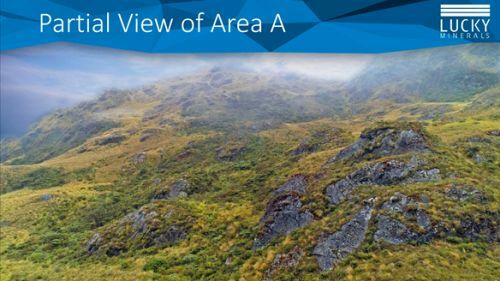 Lucky Minerals holds a 100% interest in Fortuna, a 550 km2 property in the heart of a proven and highly mineralized mineral district in Ecuador but which has seen only limited exploration and has never been drilled. Evidence of significant hydrothermal alteration & breccias, geochemical anomalies and placer mining supports potential for Cu/Au porphyry systems and epithermal Au deposits similar to numerous multi-million-ounce Au and bulk tonnage Cu deposits ~40km away. Covers a 15 km2 area in an intensely altered and mineralized porphyry copper- gold-molybdenum system in southern Montana. Nine highly mineralized breccia-pipes and two porphyry targets are known to exist within the company's claims and have been variously explored by drilling, induced polarization geophysical surveys, rock chip sampling and geologic & alteration mapping. Further information regarding can be found on SEDAR at http://www.SEDAR.com. This press release may contain forward-looking statements that are subject to known and unknown risks and uncertainties that could cause actual results to vary materially from targeted results. Such risks and uncertainties include those described in Lucky's periodic reports including the annual report or in the filings made by Lucky from time to time with securities regulatory authorities.